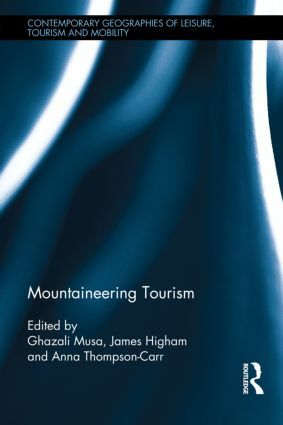 Ghazali Musa is a Professor, a medical doctor and a PhD in tourism. He is the Head of the Services Research and Innovation Center and the Department of Strategy and Business Policy at the Faculty of Business and Accountancy, University of Malaya, Kuala Lumpur. He has a wide interest in tourism research which includes scuba diving tourism, mountaineering tourism, backpacking tourism, medical tourism, and international second home. James Higham is Professor of Tourism at the University of Otago (New Zealand) and Visiting Professor at the University of Stavanger (Norway). His research interests focus on tourism and environmental change at global, regional and local scales of analysis, with particular interests in climate change and sustainable mobility. He serves as co-editor of the Journal of Sustainable Tourism. Anna Carr Thompson is a Senior Lecturer at the Department of Tourism, University of Otago, New Zealand. She is on the editorial boards for Tourism in Marine Environments and the Journal of Heritage Tourism. Her research interests focus on the interdisciplinary aspects of sustainable ecotourism, adventure tourism, wilderness management and cultural landscapes. She is a founding Co-Director of the Centre for Recreation Research at the University of Otago. Prior to academia Anna was co-owner of two adventure tourism businesses and continues to be interested in industry issues related to guiding, interpretation, visitor safety and best practices.